On Saturday, Venezuelan President Hugo Chávez denounced plans by opposition forces to offer US$100 million to assassinate him. He said fugitive media mogul Guillermo Zuloaga was partly responsible for the plot, and that Zuloaga’s television station, Globovision, could face government intervention as a result. Guillermo Zuloaga, president and majority shareholder of opposition television channel Globovision, fled to the United States last June after Venezuela’s Attorney General filed an arrest warrant against him. He is wanted in Venezuela on charges of money laundering and illegal speculation of consumer goods (hoarding new vehicles at his Caracas residence presumably to sell at inflated prices). U.S. Congressman Connie Mack, who attended the meeting, affirmed that the now Republican-dominated U.S. House of Representatives would take a harder line against the Venezuelan government. “I don’t see how the United States can continue saying we fight for freedom and democracy in the world if we don’t face Chávez head-on,” said Mack. President Chavez also said that his administration may decide to intervene in Globovision if the channel is found to be involved in subversive activity. 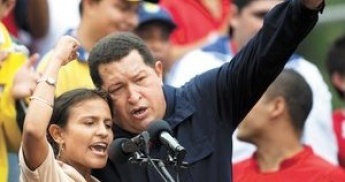 Speaking to tens of thousands of students at a Caracas rally on Sunday, Chávez reiterated his demand that Venezuela’s Attorney General, Supreme Court and Vice-President take action and speed up a pending criminal case against Globovision’s president. Globovision is a privately-owned station that broadcasts on a public concession and regularly emits news and political commentary against the Chavez government, including calls to overthrow the government and insinuated threats to assassinate the president. The station also aided the botched attempt to overthrow the democratically-elected president in April 2002 by manipulating images in order to justify the military coup. Nelson Mezerhane, the former owner of the nation’s third largest bank, Banco Federal, and a close political ally of Globovisión, is a suspect in the 2004 car bomb murder of Danilo Anderson, a national prosecutor who was investigating opposition leaders suspected of involvement in the April 2002 coup. Last June, the government took custody of Banco Federal after discovering the bank was guilty of banking law infractions, and Mezerhane fled to the U.S. to avoid prosecution. Earlier this month, the Inter-American Press Association (IAPA) – considered the “umbrella organization” for media owners and editors in the Americas – condemned the Venezuelan government’s legal proceedings against Globovision’s Zuloaga and Mezerhane. Both countries have governments that are virtual pawns of the U.S. and, as such, are having a difficult time with their native populations as they attempt to please their real bosses — U.S. mega-corporations and rich investors. Thousands of Honduran workers marched here Wednesday to demand an increase in the minimum wage and show solidarity with teachers. With their 1994 battle cry, “Ya basta!” ("Enough already!") Mexico’s Zapatista uprising became the spearhead of two convergent movements: Mexico’s movement for indigenous rights and the international movement against corporate globalization.